How do you get people to engage in dialogue? In late January, Buscada attended the first of a series of meetings hosted by MAPP International Productions to plan a new arts and community-engagement project about global interdependence, inspired by the interdependence movement championed by Benjamin Barber and others. The meeting brought together a collection of artists, writers and performers to explore ideas of civic engagement and art practice. This is the beginning of a new project in collaboration with MAPP International Productions to understand the processes and practices of engaging civic dialogue, art practice and pedagogy. This project is a continuation of our work begun with The America Project Teaching Method. How do you answer this question for yourself? How do you encourage dialogue? We hope this is the start of a long and productive conversation. Most New Yorkers know SPURA, but often, unless they’re Lower East Siders, they don’t know that they do. Many have walked through the LES along Delancey Street, noticing the parking lots on the south side of the street near the Williamsburg Bridge. Or, they’ve walked down Norfolk to Grand Street, noting the unevenness of development and an odd sense of unfinished-ness they can’t put their finger on. This is SPURA, the Seward Park Urban Renewal Area. It is more than six square blocks that 42 years ago were subject to highly contested “slum clearance” – resulting in the displacement of many people – and an unfinished “renewal,” with few planned buildings actually built. These decades-old events have resulted in one of the largest and longest-standing undeveloped city-owned plots of land. SPURA is at the center of Lower East Side debates on affordable housing, debates which have sometimes been painful and highly race- and class-based. There are passionate communities involved in the question of SPURA, communities which for 42 years have been unable to reach productive dialogue and negotiation. Each year for the past three, I have taught a class called City Studio which takes a visual urbanist approach to SPURA. I teach students creative ethnographic, visual, archival, and community-based methods to understand and represent SPURA’s contested urban space. My classes research in archives and with community members, take part in community planning processes, and work in partnership with our community collaborators, GOLES, Place Matters and the Pratt Center for Community Development. Finally, each year’s class creates and curates an exhibition to help envision the site’s past, present and future(s), and try in one small way to spark, and create space for, productive and peaceful dialogue on the area. This week was a big one for SPURA itself and for my class. Today saw City Studio 2010’s final critique (one project, “Framing SPURA”, above) – and it was one that bodes very well for our exhibition which will open at common room 2 in February 2011. Images from all of the projects in the final critique are here, on flickr. This week, SPURA itself has been in the spotlight. The question of SPURA has been under consideration by Community Board 3 for the past few months, in fascinating conversations, and some heated debates since October about the possibilities for affordable housing on the site. This Monday saw the debates grow more heated – but led a step closer toward agreement, and, importantly, to the potential for a larger stake for affordability on the site. The next few months will be crucial for SPURA – and what its development means for those displaced from the site, for those living in the neighborhood, and for the city at large. This week, it’s been good to see the press taking some notice – from the local LES blog, the Lo-Down, to Manhattan local news on DNAinfo, to finally, the New York Times. This fall, we’ve been developing an exciting new collaborative curatorial project, working with the Remember the Triangle Fire Coalition and Ruth Sergel. In honor of the upcoming centennial of the Triangle Shirtwaist Factory Fire on March 25, 2011, we’ve developed and designed the Triangle Fire Open Archive, a curated online archive of community-created objects and stories. We’re encouraging people to submit objects culled from personal & public collections, and to use these objects to tell their own stories relating to the history of the Fire, or to the labor, immigration and gendered issues of the Fire that are still critical and resonant today. Through the collaborative curation of the Open Archive, we’ll be able to see objects, and read narratives, never before seen together. On Monday December 13, we had our first evening of collecting objects, working with Lucy Oakley and Marci Reaven’s class at NYU, who have recently curated the soon-to-open Grey Art Gallery exhibition, “Art/Memory/Place: Commemorating the Triangle Shirtwaist Factory Fire”. The students did a phenomenal job of writing new reflections on their favorite objects they’ve found in researching the Triangle Fire – some drawn from public collections (as above, a portion of an image from the Kheel Center), and some drawn from their own family albums. Many contributed these objects (in digital form) to the Open Archive, and we’re thrilled to have started down the path building the Triangle Fire Open Archive with them. We look forward to many more people getting involved, contributing objects, and telling stories through the Open Archive in the months to come – either through our online tool or at our open public events, when we’ll help photograph and digitize people’s objects. All the digital material collected will be donated and archived by the Kheel Center which hosts the preeminent website on the Triangle Shirtwaist Factory Fire. The site will go live in January of 2011 – we’ll keep you posted! In the Fall of 2009 I embarked on an experiment with my colleague, landscape architect Elliott Maltby : co-teaching a hybrid design and social science studio on public space at Parsons the New School for Design. I reflected on the interdisciplinary process of developing our “Public Space Critical Studio + Practice-based Seminar” on this blog few months ago, here. Once the class was over, Elliott and I did some deeper reflecting, and wrote an article on our experience of developing and teaching “hybrid ways of doing.” I am pleased to announce that this article, valuable for anyone thinking about interdisciplinary collaboration and teaching, is now available in the most recent edition of the International Journal for Architectural Research. “Hybrid ways of doing: A model for teaching public space” by Gabrielle Bendiner-Viani and Elliott Maltby is downloadable here and from the project as featured on Buscada. We welcome your experiences with this kind of teaching and thinking. In particular, Amy has noticed that some of the prominent Hawaiian cookbook writers were also active in the statehood movement, and so, has been investigating this connection further. 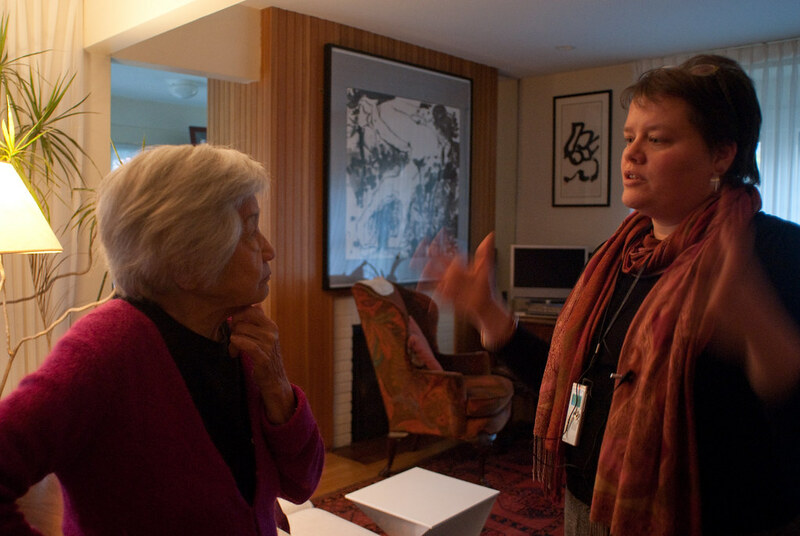 It was one of these investigations that brought her to visit the aforementioned Elizabeth Toupin, an eloquent and fascinating woman who has written many cookbooks, as well as being a Dean at Tufts and a social researcher, among many other things. Our afternoon at Toupin’s home in Somerville was one of delicious food, heady conversation, and the exploration of many well-thumbed and annotated books. It was also exciting for me to cross a multitude of disciplinary lines to work with Amy and to get to know Liz. In my role of photographer and ethnographer, it was a privilege to be there and I look forward to the rich work of Amy’s that I feel sure will emerge from those conversations. 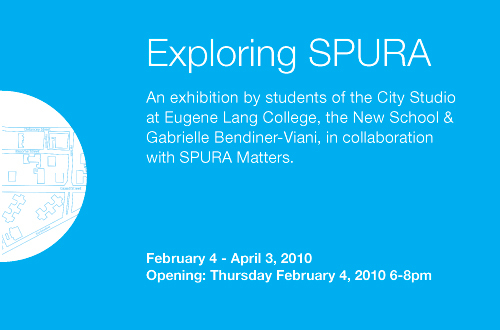 An exhibition by students of the City Studio at Eugene Lang College, the New School & Gabrielle Bendiner-Viani, in collaboration with SPURA Matters. Please join us at a new exhibition by the New School’s City Studio, Exploring SPURA, which delves into the experience of living at SPURA now – the resources and restrictions – as well as the stories of today and the experience of the SPURA diaspora, displaced many years ago. The exhibition springs from the City Studio’s research in the community and hopes to continue encouraging productive conversation about the site’s future. The question of SPURA is a timely one, as plans for its development are in discussion once more at the Community Board. Come join the conversation! The 2010 City Studio creators of Exploring SPURA are: Sarah Charles, Jamie Florence, Leijia Hanrahan, Anke Hendriks, Lila Knisely, John Lake, Claudie Mabry, Katie Priebe, Adam Schleimer, Kaushal Shrestha, Emily Winkler-Morey and Hannah Zingre. Gabrielle Bendiner-Viani is the professor and exhibition curator. The City Studio course of the Urban Studies department, Eugene Lang/New School explores the life of a small urban space, through archival, ethnographic, visual and participatory research. SPURA Matters is a visioning project for the SPURA site to get people talking about SPURA’s future. It is a collaboration between Good Old Lower East Side, Pratt Center for Community Development, and Place Matters/City Lore.